Buona Pasqua is Italian for Happy Easter! My Nunnie, Josephine Vallelonga Spatafore, lives in her kitchen. It’s where the stories, the food, the kisses, the cheek pinching, the laughter, the tears and of course, the wafting aromas of garlic all reside. She loves to feed her friends and her family. I’m amazed how there’s always a fresh batch of Italian cookies on her counter and homemade spaghetti sauce simmering on the stove. My (non-Italian) friends used to be scared if they weren’t hungry, because they knew my Nunnie (or mother) would encourage them to eat over and over, they finally would oblige. One of the many Italian traditions I remember is Easter with my extended Italian-Catholic family and devouring my Nunnie’s toasted, warm Easter Bread, with hints of toasted anise covered in melted butter. My Nunnie and her sisters, Mary-Jane and Angie bake hundreds of loaves of Easter Bread every season. Enjoy this Easter Bread recipe, adapted from my Southern Italian (Calabrese) Great Grandmother, Nunnie Vallelonga. Note: All ingredients must be warm at room temperature. Dissolve the yeast in the 4 cups of warm water. Scald the milk (to boiling point) remove from heat, the butter doesn’t have to melt. Set the scalded milk aside, to let it warm (don’t let it cool). In a large mixing bowl, dissolve the yeast in the warm water with a small pinch of sugar. Let sit 10 minutes. Whisk the eggs and sugar in a separate bowl. Then add the yeast, followed by the butter, milk, sugar and anise. Next, add the flour into the mixing bowl. Mix well with a wooden spoon and work and knead until smooth and elastic (not rough or dry). Lightly oil the pan and dough. Cover and let rise in a warm area, for 30 minutes until it doubles in size. After the first 30 minutes, punch it down a couple times and let it rise covered again, until it has doubled in size (another 30 minutes). Lightly oil the bread pans in preparation for baking. Next, shape it into a regular loaf or into a braided loaf (as pictured). To make a braided loaf, cut three strips, each weighing 6 ounces that are about 9 inches long and braid them. Let it rise again for a third time for at least an hour, once it’s in the greased bread pans. Bake at 325 degrees Fahrenheit for 45-60 minutes. About 10 minutes before taking the bread out of the oven when it’s golden brown, brush an egg wash (1 egg with 1 tablespoon water) over the top of the bread and bake for another 10 minutes. Makes 7-8 one pound loaves. Varying types of loaves from my Nunnie and Great Aunts, from the Vallelonga family. Note: You can see other varieties and styles of Italian Easter Bread here on Foodily. I love reading about traditional family recipes since my family has very few. This bread looks fantastic. It was so nice meeting you on Saturday. I hope to see you again soon. Just spoke with my Nunnie (her recipes are old, she does it with her eyes closed practically) but she said regular milk is fine. So I changed it to 2 and 1/2 cups regular milk. Thanks for stopping by! Hope you enjoy it. Hi! Your Nunnie’s Easter bread looks beautiful! 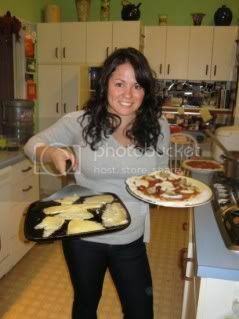 Would you tell me the size of the loaf pans she uses in the photo? Thank you! Hi Maura! The pan in the photo is: 8 1/2″ long, 4 1/2″ wide 2 1/2″ deep. She has owned these for a long time, but she said that a regular loaf pan will suffice if you can’t find that exact size. Hi! I can’t wait to make this! Does this recipe make one loaf? or do you need to cut the dough into sections to make more then one? Hi Ashley! It makes 7-8 one pound loaves that you would cut the dough up into sections to create. Let me know how it comes out! How many packets of dry yeast is that? Hi Ashley – I don’t know off the top of my head as each yeast packet is a bit different. This recipe is years old from my Nunnie, sorry for any confusion I always make it with her and through her instruction. If you have any other questions, I can definitely ask her as well! Theres a terrific amount of knowledge in this ariltce! Does 4 oz. sound right? 1/3 of a pound is quite a bit isn’t it? Hi Ashley – I’ve updated the recipe to “2 packets of dry yeast” this will work with the 5 lbs of flour included here. Thanks and let me know how it turns out! Those are just gorgeous! Love family recipes like this. It is fun. I wish I had even more pictures as I’m never there when they’re making them before Easter. It’s a great traditional recipe. Hello Grace, this is a very good recipe and everyone loves it. Did the recipe change? I thought it orginally had 7 eggs in it when I copied it about a year ago. Thanks. My son gave me your website because I was looking for a recipe for authentic Italian Easter bread. I just took 4 loaves out of the oven and, of course, snuck a little piece ~~ gotta make sure of the quality before serving it, right? LOL! Well, let me just say I can’t thank you enough. It is beyond delicious! And reading about all your holiday and family memories just made my day! Now I’m gonna ask my son how he found your blog. He just moved to Colorado himself about 2 years ago. Thank you again and Happy Easter!! Hi Claire! So happy to hear this and thanks for stopping by, trying the recipe and leaving a comment. My Nunnie will be happy to hear it. That said, thanks to your son. Does he read my blog regularly? Always interested in meeting new people who love food. Glad to hear the recipe was delicious. Yum yum! Hope you had a happy Easter! Yes! I am constantly making sure it’s updated and it was hilarious to put out digitally. My nunnie and her sisters do it from memory there is no recipe so they were all arguing about which ones was best 🙂 This should be pretty good but you can see in the comments we have some adjustment and questions answered! Grace, how blessed you are to have your Grandma and Aunts in your life. I miss mine so. But—-did you really mean 5lbs???? of flour—- I was thinking you meant 5 cups. My fathers family was from Calabria and they used black anise seeds in the bread. My favorite Easter treat. Thank you. Thanks JoAnne and yes, I agree. The 5lbs is the correct number. As you might notice, this recipe makes 7-8 loaves so it’s a bulk recipe (my nunnie never makes less than this). If you want to make less you can slim down the recipe or half it. We like to freeze the Easter Bread, it tastes just as good when you take it out and toast it up with some butter on it. Hi Grace, after searching the web for an authentic Easter Bread I cam across yours a couple of years back. I love making a double recipe and sharing the bread with my family and friends. I just noticed though that there is no place in the recipe for adding the vanilla and the salt. I figure you add vanilla into egg (wet) stage and salt into the flour (dry) ingredients. If this is incorrect can you let meknow. Thanks for posting! My Italian, from San Marino and Cassino, didn’t make Easter bread so I am glad to start a new tradition.